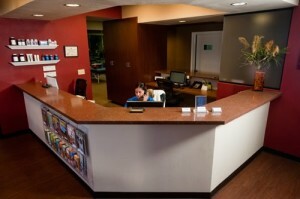 We here at Camelback Medical Centers know that to maintain good musculoskeletal health, you need to have good posture. Many people don’t focus on the way they sit, stand, and sleep on a regular basis because, let’s face it, it’s hard to do. It sometimes seems like an insurmountable hurdle to develop good posture when you don’t have it, but once you establish good habits, improved posture has many health benefits. Good posture promotes proper alignment, and when your body is aligned correctly, you can avoid the kinds of joint and muscle strain that lead to joint pain. Good posture also allows your muscles to work more efficiently, making your everyday activities easier and reducing your chance of injury. Our Phoenix and Scottsdale Chiropractic Professionals want you to know that developing good posture doesn’t have to be hard! Today we’ll give you our best advice for improving your posture so you can take advantage of the numerous health benefits that come with it. Many things can cause a person to develop poor posture, including their work environment, stress, weakness or tightness in their muscles, pregnancy, and footwear that doesn’t provide enough support. These are very common situations, and it’s easy to fall into habits that lead you to slump, slouch, and put unnecessary pressure on your muscles and joints. Poor posture can affect you wherever you are, whether you’re sitting at your desk at work, walking around, or even sleeping! The good news is that improving your posture isn’t hard if you pay attention to how you sit, stand, and lie down. Rather than quick fixes, though, you have to commit to changing how you carry yourself on a daily basis. When you’re sitting down, you should keep your feet on the floor to promote proper alignment. If your feet don’t reach the floor, you should use a footrest for support. Crossing your legs can also lead to alignment issues over time, so be sure to keep your feet on the floor, with your ankles in front of your knees. You can also use a lumbar support to prevent slouching. For proper posture while standing, you should keep your feet shoulder-width apart and concentrate on keeping your shoulders pulled back and your stomach pulled in. Also, shifting your weight from your heels to the balls of your feet can help align your body. Promoting proper posture while you’re sleeping can be a bit tricky, but it’s still possible. First, you should avoid sleeping on your stomach. Second, our Phoenix and Scottsdale chiropractic professionals suggest that you should use pillows strategically, placing a pillow between your knees if you’re a side sleeper or behind your knees if you sleep on your back. If your current mattress causes you discomfort, purchase one that allows you to sleep comfortably. Proper posture is essential to your long-term health and well-being, and our Phoenix and Scottsdale chiropractic Professionals are committed to helping you develop good habits that keep your body aligned. Give our team a call today in Phoenix at (623) 872-0002 and in Scottsdale at (480) 945-0008 to schedule an appointment!